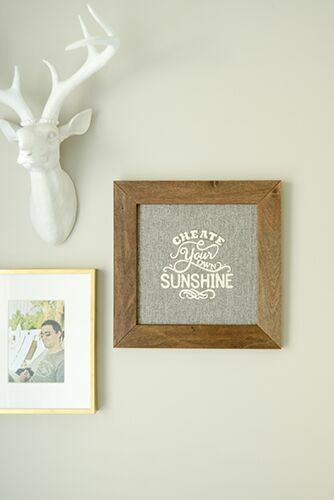 Spice up your wall décor by creating this custom piece of framed art on a textured burlap base. Choose a 12” x 12” frame and a stencil of choice. Find the center of the burlap and mark with a pencil. Spray the back of the stencil with a repositionable “stencil adhesive” to hold it in place. Lay the stencil lightly on the burlap, paying special attention to ensure that it is centered on the sheet. Once desired placement is located, press down all edges so they are secure and flush with the burlap. Use a stencil brush to paint the saying in place. Move slowly and with as little paint as possible until complete. Let the paint dry fully, then remove the stencil and place the burlap into a frame. When applying paint to the burlap, be sure not to add too much at a time. This will help to avoid any smearing or seeping. If unsure about using a standard brush with the stencil, try using a round paintbrush. This will allow you to dab the paint into place instead of potential smearing it or adding it underneath the stencil. Change up the burlap color, saying, or paint colorto match the décor.